When I was younger, for whatever reason, I thought that Jack Handey was actually Al Franken. The idea that Jack Handey — known most for the “Deep Thoughts” segments on Saturday Night Live — was a pseudonym is a surprisingly common one. But later, I discovered that the idea that he was Al Franken in particular was also pretty common. Al Franken even wrote a foreword where he declared that many people thought that he was Jack Handey — he’s not, and Jack Handey is a real guy — but why Al Franken in particular? That’s something I’d really like to know. “Jack Handey” sounds kind of like a made-up name itself (especially that “Handey” is a misspelled version of an everyday word, and coupled with “Jack” just makes it sounds vaguely dirty), but why do people think that it’s made up by Al Franken? Why did I think he was Al Franken?The book What I’d Say To The Martians doesn’t answer that question. In fact, it doesn’t address it or even allude to it at all. If you pick it up only to find out why people think that Jack Handey is actually Al Franken, you will be disappointed. In fact, the words “Al Franken” do not even appear in What I’d Say To The Martians, not even in the acknowledgments — talk about ungrateful. Jack Handey has gone this long being thought to be Al Franken in disguise, and he can’t even thank him? Jeez. Luckily, what Jack Handey has in ingratitude, he has double the amount in skill at writing the perfect joke. 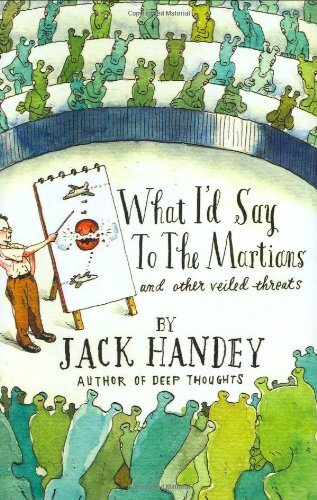 What I’d Say To The Martians is — rather than an explanation of the Al Franken mystery — a collection of short essays and a few Saturday Night Live scripts that are all hilarious. Seriously, I actually and literally laughed out loud while reading this book. And not just in a lame “LOL” way, or one where one says aloud “Ell Oh Ell”, which is even worse, and honestly, if you say that, please stop. This is not what Jack Handey would look like as a United States Senator. If you’ve read or seen the “Deep Thoughts” segments, you know what Jack Handey’s sense of humor is like. And if you don’t like those, I don’t think I’d like to know you. When the pieces are strung out longer, there’s never any worry that they’ll snap and break; as perfect as the “Deep Thoughts” can be (my favorite, and I think it’s most people’s — “The crows seemed to be calling his name, thought Caw”), the essays build on themselves and can create a world of their own. Jack Handey’s newest book, a novel called The Stench of Honolulu is said to be a book written from the point of view from the “Deep Thoughts” character — and I’m looking forward to reading that. The essays seem to be written from that same character, with a few recurring bits (his “friend” Don, his funny cowboy dance) which I’m expecting to be in the novel as well. And perhaps, finally, The Stench of Honolulu will explain why so many people think him to be Al Franken.